Different date this month – make sure to mark your calendars! For anyone that can’t always make it to our events in person, this is for you! It’s virtual coffee time with Brandy Stiles, from the comfort of your own home. Call or log in using a phone, smart phone, tablet or computer. 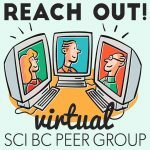 Contact Teri tthorson@sci-bc.ca for more details.